Mommies with infants do you know the importance of “Tummy Time”? Because of the amount of time babies spend on their backs sleeping and in “Containers” like car seats, bouncers and swings they need plenty of Tummy Time while awake. Tummy Time improves neck and head control, they are less likely to develop a flat spot on the back of their head and it strengthens back and shoulder muscles. It also encourages the next stage of motor development such as rolling over, supported sitting, sitting alone, crawling and standing alone. 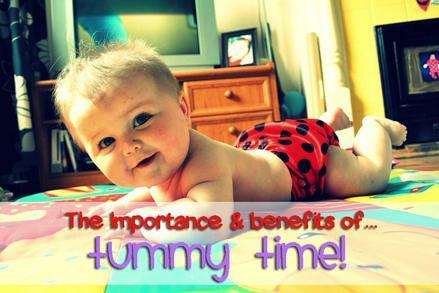 Tummy to Tummy - Enjoy bonding time by laying her/him tummy down on your tummy. Eye-Level Smiles - Make sure you get down on the floor face to face, talk or sing since your baby loves the sound of your voice. Lap Soothe - Lay your baby tummy down on your lap to soothe. Tummy-Down Carry - While moving around the house another way to carry your baby is in the tummy down position, this starts to prepare them for Tummy Time on the floor. Tummy Minute - Start your Tummy Time on the floor with just minutes at a time. Many babies do not like this at first, but it is important. Again get face to face, or use a favorite toy, or use a baby-proof mirror to stimulate interest. Any interaction one on one with your little one grows a healthier baby. Don’t get discouraged. Every bit of “Tummy Time” makes a difference.